Facebook confirmed last week that it was developing and testing a new feature called Happening Now, as it told the Next Web. The feature would allow users to see in real time what their friends are commenting on and "liking." Happening Now was rolled out to a "small percent" of Facebook users. The feature is clearly an attempt to replicate (or at least tap into) the power of real-time sharing, which Twitter has dominated since its inception. The Happening Now bar appears on the right hand side of a user's Facebook page, displaying real-time updates below the dedicated spaces for advertising, letting users see how their friends are interacting with one another without having to leave the main page. Currently, information that appears in the News Feed also pops up in the Happening Now feed--a redundancy Facebook will surely try to correct. Though the feature may be tweaked and refined before it is rolled out to the larger digital public, the meat of the feature will probably remain, as Facebook tries to inject some of the real-time urgency which makes Twitter so powerful and addictive. The Happening Now column at the right shows what your friends are doing in real time. The effects of the new feature will also put greater focus on functions such as Check-Ins, which now show up instantly in the Happening Now bar. Though some users have balked--there is already a plethora of negative comments popping up around the topic online--the Twitterization of Facebook holds some advantages for businesses looking to promote their services. Mainly, because Happening Now highlights real-time activity, businesses have the opportunity to respond to a user's real-time location. If a follower of your café checks into a restaurant nearby, for example, you could offer them a special deal on dessert and coffee after their meal. These could be offered through messages and remain completely private between the two parties. The Happening Now feature gives business owners the opportunity to connect in real time, one-to-one with their clients. Of course, Twitter already enables this kind of instant communication, but many small business owners simply don't have the time or resources to be active on both platforms. Facebook's Happening Now feature will give many time-strapped small businesses the opportunity to consolidate and focus their social media campaigns onto one platform. But before that happens, first users have to buy in. I've always enjoyed the time distinction between Facebook and Twitter. 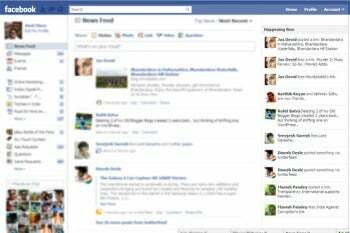 I can log into Facebook and more passively browse and communicate with my social network. I check Twitter more often, and for a shorter period time, to get an immediate snapshot of what my network is doing and thinking. But, habits can change. And if Facebook can offer a compelling, centralized place to both browse and stay connected in real time, it could be a boon to businesses and users alike.